While Hollywood Studios such as Warner. Bros, Disney, 20th Century Fox, and Universal, usually churn out big-budgeted and / or big named feature films every year, A24, a smaller film production company, has been flying underneath the radar for several years, producing some hidden films. Originally named A24 (before becoming just A24), the studio has created several low-budgeted, yet successful movies such as the sci-fi film Ex Machina, the Oscar-award winning drama The Room, the oddly humorous Swiss Army Man, and critically acclaimed documentary Amy. Now, A24 and director Trey Edward Shults, present their newest film; a horror suspense thriller titled It Comes at Night. Does this movie deliver on its thrills and expected premise or does it flounder and fade into the background of recent horror movies of late? In the aftermath of unknown virus menace, which has ravaged the world and created global pandemic, the survivor in this post-world hunt for clean water and secure shelter. Set in a remote forest home, Paul (Joel Edgerton), keeps order, building a fortified structure dwelling for his wife, Sarah (Carmen Ejogo) and their son, Travis (Kelvin Harrison Jr.), laboring to make sure the trio is safe and protected from viral exposure and, for that matter, most of the outside world. Late one evening, Will (Christopher Abbott) is caught breaking into their home, with Paul being extremely careful with their intruder, cautiously figuring out if his story of supply hunting for his wife, Kim (Riley Keough), and their young son is actually true. Learning to trust the stranger, Paul welcomes Will and his family into his house, teaching them the rules of living with them and building a peaceful co-existence amongst them all. Unfortunately, panic sets in when the family dog manages to escape while picking up a mysterious presence in the woods, sparking newfound fears of contamination in the house, which swiftly turns to paranoia amongst the two families; drumming up suspicions on if one of them is carrying the deadly disease or not. Like I said above, A24 has proven a name for itself for producing and / or distributing films, having releasing movies that many, including myself, might overlook in comparison to other big studio releases that come out the same time. A perfect example of this was their 2015 film Ex Machina, which flew under everyone’s radar (including myself) and became such a popular hit with many. Their films make not bring in the big office dough that other big Hollywood studio do, but majority of their movies have been met with critical praise from both critics and moviegoers, with a few becoming nominated during the award season, including the film The Room, with actress Brie Larson winning the Oscar for Best Actress. This, of course, brings us to my review for this movie. I don’t recall hearing of any internet news or buzz feed for It Comes at Night, but I do remember seeing the film’s trailer several times (while I was at my local movie theater), with the film’s tagline “the most unnerving film of the year” being toted. While I’ve said I’m not a usual fan of horror movies, so I initial passed on the movie, choosing to see (and review) movies that were more to my style and liking. However, I’ve been reading a lot of reviews for the movie and notice that a lot of people are praising the feature and giving it (mostly) positive reviews. So, before it got pushed out of my local theater, I decided to go see It Comes at Night and to see if all the “word of mouth” about the film was true. Unfortunately, I may be the odd man out about this picture as It Comes at Night is somewhat of a perplexing movie as the film that was advertised wasn’t exactly the film I saw. Adding to that, the movie itself wasn’t incredible awesome as some were making it out to be, but neither was it downright awful. It’s just somewhere in-between and that sort of frustrates me. It Comes at Night is directed by Trey Edward Shults, whose previous includes several short films like Mother and Son, Two to One, and Krisha, which was released in 2014 and then became a feature film in 2015. In addition, Shults also served as writer, editor, and producer of those films (even starred in both versions of Krisha). That’s quite impressive. Also, just so you know, Shults is a relatively newcomer young director, which makes It Comes at Night is just foray into a major motion picture. 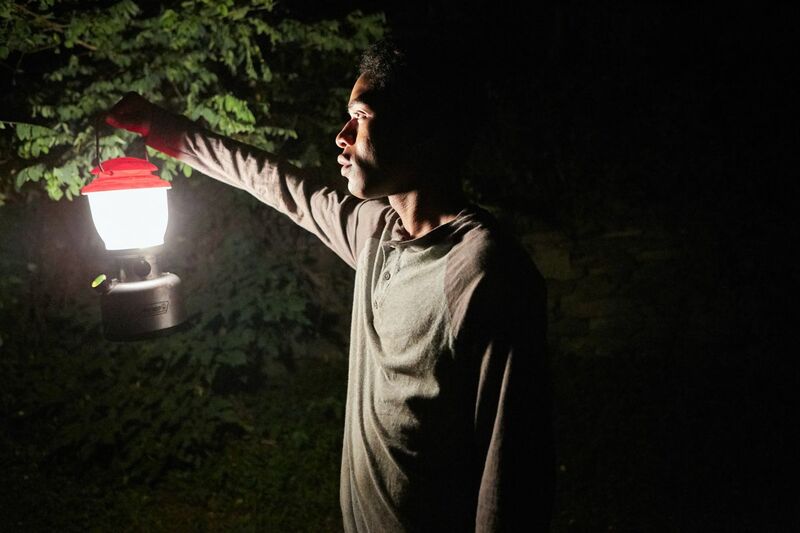 Granted, It Comes at Night isn’t exactly a big-budgeted film (roughly made for $ 5 million dollars), but the film was released nationwide. Thus, the movie gives the young director has chance to show what he’s capable of it helming a major release feature film. To his credit, Shults handles himself well (filling in the roles of director, writer, and editor for the movie), creating a sense of morbid dread throughout majority of the picture, with Shults utilizing the film’s setting has an isolated and remote area, with Paul’s fortified home acting as the main centerpiece for most of the film. Shults also keeps the story’s world building narrative minimalistic and shrouded in mystery. We (the viewer) are told and shown that there is a viral epidemic going on in the world, but the film never goes into the reasons why. We don’t see the virus’s origin, or “patient zero”, or the fall of the government / society, or the deconstruction of a global outbreak, or anything like that as Shults keep the movie primarily focused on the events of what happens within Paul’s dwelling. While some viewers might really be frustrated with these unanswered questions, I personally found it to be quite interesting, leaving a lot to a person’s imagination and drawing his / her own conclusion on the matter. In addition, Shults’s film is a bit more fresher and newer than most horror films of late. It you really think about, with many horror features been produce each year, they’ve started to bleed into one another and recycle various ideas, concepts, and scenarios. It Comes at Night is not about a supernatural entity, or a paranormal spirit from the “great beyond”, or a nightmarish being from darkest legends, it’s about a family surviving in a post-apocalyptic viral epidemic world and cautiously aware of any newcomers that they meet. In a nutshell, the film presents the “human condition” of fear and paranoia; something that’s hits more closer to home (for everyone) rather than haunting spirit or some ghoulish apparition from Hell. Perhaps my biggest complaint about this movie (and the most notably one) is how the movie was label during its marketing promos. Being called “one of the most unnerving movie of the year”, one would think that It Comes at Night would be something truly striking and completely nerving racking in its horror aesthetics and suspense nuances. However, the actual film itself was completely opposite, turning out to be more of a creepy suspense character study film rather than supernatural horror (something that most horror films are today). I have no problem with this, but the film’s marketing (trailers and TV spots) show off more of supernatural horror elements, which are in the movie, but are not presented in the proper context that a viewer might think of. So, it really begs the question on why they used those supernatural elements in the movie> (or even in its marketing campaign?). It’s for this reason why I didn’t care for the movie as much as others did. Yes, it was nerve-racking (providing my point above being different from other horror films of late), but the movie is completely mislabeled from the get-go. Was it suspenseful at certain part…. yes, but it definitely wasn’t “the most unnerving movie of the year”. Another problem I found with the movie is that it was too much of an arthouse feature. Elongated scenes of camera movements and facial reactions / expressions were way too frequent in this movie. This artistic approach can work sometimes (see The Revenant), but the usage of it in It Comes at Night was oversaturated in its endeavor. In addition, the movie is also a slow-burner, which is not half-bad as it builds up it tension in certain scenes, but I personally felt as if the film went on for far too long, despite the fact it’s runtime is only 91 minutes long (the somewhat standard rate for an animated feature). Lastly, the film’s ending is somewhat ambiguous as it sort of just ends very abruptly, leaving a lot unsaid. While the movie’s unanswered world-building questions didn’t bother me (it may bother many), the film’s ending just felt very unsatisfying for me. Much like the film itself, the cast of It Comes at Night is small, but is effective, with majority of them delivering solid acting performances within their respective roles. Of course, leading the charge as the big named actor of the film is Joel Edgerton as Paul, the head of the forest household. Edgerton, known for his roles in The Gift, Warrior, and Black Mass, gives a solid performance as Paul, an individual who acts as the alpha male of the group in keeping his family safe as well-being cautiously optimistic about his new guest that he invites in his house. Likewise, Christopher Abbott, known for his role in Girls, Whiskey Tango Foxtrot, and James White, provides effective and equal to Paul (a man who cares for his family) as the character of Will. The other two characters (Sam and Kim), the wives of Paul and Will, aren’t as completely well-rounded as their husbands, but are serviceable in their roles and are acted finely by Carmen Ejogo (Fantastic Beasts and Where to Find Them and Alien: Covenant) and Riley Keough (Mad Max: Fury Road and American Honey). The only role that I particular really didn’t care for was for the character of Travis, who is played by Kelvin Harrison Jr. (Roots and The Birth of a Nation). While I don’t doubt Harrison Jr.’s acting ability or anything like that, but the character of Travis is very bland and uninteresting for majority of the feature, which is strange because he’s supposed to be the character we (the viewer) follow the most. Fear, paranoia, and the mystery of what goes “bump” in the night are the instrumental narrative beats within the film It Comes at Night. Director Trey Edward Shults newest movie delves into the psychological side of panic and fear within the “human condition” with the usage of an isolated setting (and a post-apocalyptic pandemic) for the feature’s backdrop, providing there are greater things to fear within fellow humans rather than supernatural horror. However, while the cast is solid in their acting and Shults’s directing is noted, the movie itself is not what it’s cracked up to be, finding its misleading marketing promos frustrating with the film’s final product as well as its arthouse apporach and stagnate progression. Personally, I have really mixed feelings about this movie. I applauded its breaking the “status quo” of recent horror flicks of late, but I can’t help but be somewhat frustrated with the mislabel marketing for the film, a too art-house-y approach, and a slow-paced narrative that it come with a satisfying payoff. Thus, my recommendation for this movie is a solid “iffy-choice” as some will sing it praises while others will be disappointed with it. Me, personally, I’m somewhere in the middle as I said that I have a strange paradoxical feeling about this movie. All in all, It Comes at Night does freshen up the landscape of today’s horror movies (i.e. Annabelle: Creation, Rings, and The Bye Bye Man). However, it just doesn’t live up to its own hype. Nice review Jason. I loved this film but that might have been because I managed to not get it put into any kind of box before watching so my expectations were not disappointed. I’ve seen quite a lot of A24’s output so I think I knew it wouldn’t be a general horror piece (The Witch had the same vibe for me). I also really like the choices of films that they put out, they aren’t your blockbuster film and that’s nice in this day and age of universes and sequel/prequels. More and more I’m trying to avoid trailers and any kind of spoilers so that I can just enjoy the film without hype affecting me. This was one that I managed to experience that way, I’m hoping there are more! Yeah, I heard people comparing this film to The Witch and I agree with you that A24 is different than most Hollywood studios out there. I just really think that this film’s marketing promos were completely misleading to what the film actually was. Good review! I really liked the movie, but I understand where you’re coming from. I’m a fan of movies like these with a more arthouse feel about it that you can then dissect. The film was indeed wrongly marketed, but I think that it was to widen up the audience, since not a lot of people like to see an arthouse-ish horror film. And I’m glad that you liked this movie. Like I said, the movie is an “iffy-choice” as some will like it, while others won’t. I appreciate Shults’s work on the film, but maybe this movie just wasn’t for me. Great review. You were far too kind. This was a bait and switch by A24. The title was misleading and made most people feel they were paying to see a horror movie about Werewolves or something else that comes at night. A much better film that shows the evil we do to each other out of paranoia is The Village. Hahaha….well, I didn’t hate it much as you did, Damien. However, I really can’t ignore the “bait and switch” move that was pulled on this movie. I liked this, I could have done with a little less vagueness, however. I like to be challenged, but I also want threads to go places, not all of them did. I do wonder if I would have loved it if it weren’t for the trailer expectations. I think it’s a good story, but lacking any real arcs in characters. However, it is impeccably directed in my opinion. I agree with you. Given this is Shults first major motion picture, I do give him credit for tackling this ambitious film. The vagueness of the film’s background plot was okay for me (didn’t bother me as much as some did), but I think the trailer’s expectations for the film is what did me in with It Comes at Night. I was expecting the movie to be this really unnerving movie, but was hardly unnerved at all.